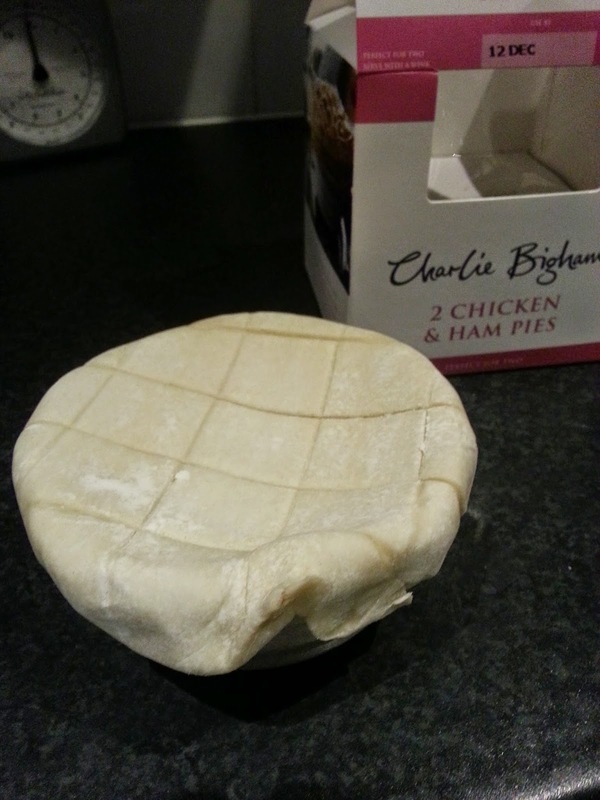 Pierate - Pie Reviews: Charlie Bigham pies - Will I bigham up? Charlie Bigham pies - Will I bigham up? I have had my eyes on these pies for a while now. Charlie Bigham's pies, available in Waitrose, have always looked very appealing, but until now I had been put off buying them. The first reason was the fairly hefty £7 price tag (although that is for 2 pies), and the other is that I had always assumed - by virtue of their ramekin dishes - they would just be a top-crust pie (and hence not a proper pie). But finally the time has come for me to give one a try. I bought a pack and took them home. As my friend remarked when I opened the box, the pies (which come wrapped in a bit of attractive paper) look "amazing" and "super-deluxe". As I feared, though, these are indeed just top crust pies (TOP CRUST ALERT)! 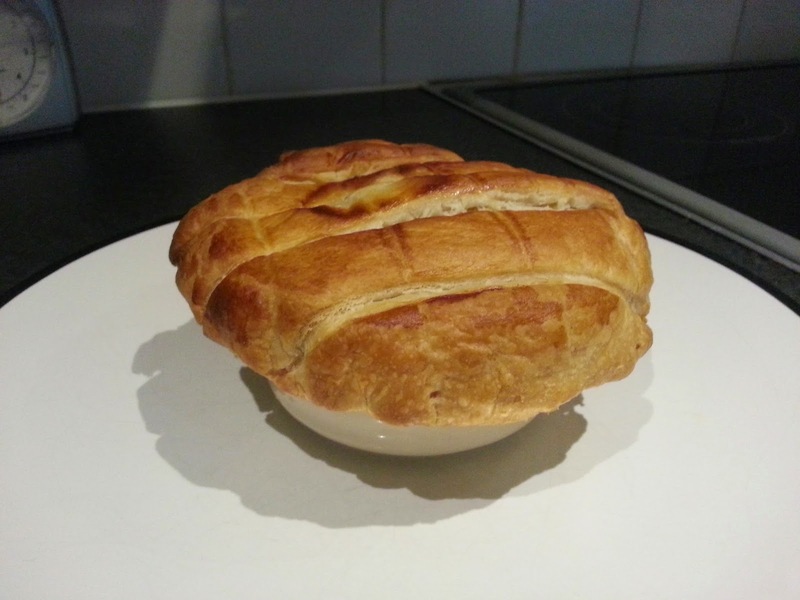 However, the presentation is excellent, and the pie does look very homely and inviting with its criss-crossed floured pastry draped over the pie dish. I dash it with some milk and put it in the oven. Oh yeah! That's what I'm talking about! The light puff pastry has risen well, creating beautiful golden brown hills gorged with pale pastry canyons. This is beautiful stuff. It's hard to do a cross-sectional view of a top crust pie (as I can't really cut the dish open), but here's a sneak peek inside anyway. You can see there are some good chunks of chicken and oodles of tasty ham. The sauce is creamy and delicious - however I think its consistency would be too runny to put in a standard fully-pastry-encased pie. This filling is very tasty, and the pastry is light and puffy. The meat is not chewy and seems high quality, with no gristly or chewy bits. I would have liked a bit more chicken in there. Overall, the pie tastes nice and would be a sure-fire winner at the table for a dinner-for-two. 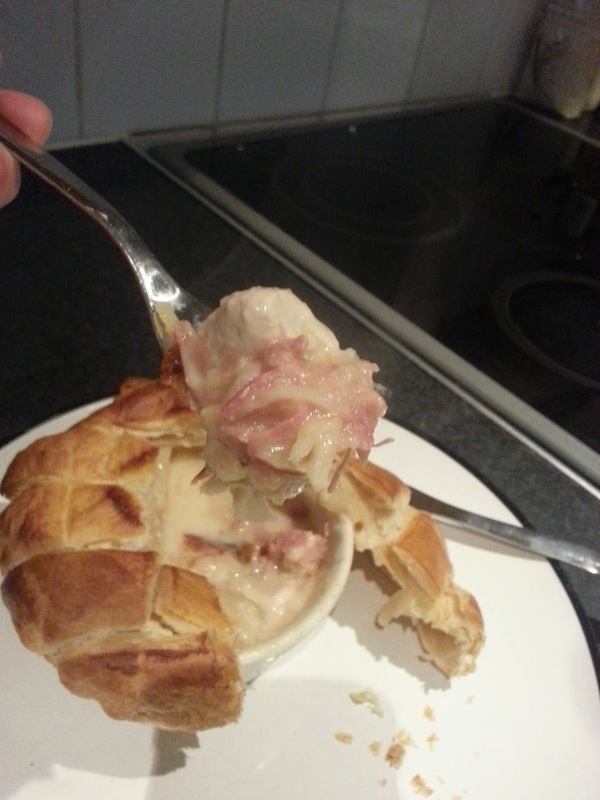 However it looses marks for not being fully encased in pastry, sauce a bit too runny, and a bit low on chicken. Based on this experience, however, I am tempted to try some of the other pies in the Charlie Bigham's range - so that can only be a good thing. Should you hurry to Harrods for mince pies? Duchy wish your mince pies were just like these? And a Partridge in a Pear… pie?! Will the Wycombe pies be a phat lot of good?! Do Booths Luxury Mince Pies butter me up?